Learn how to use the Nimble Smart Contacts App in Google Chrome to access Nimble in Gmail and everywhere else you work! 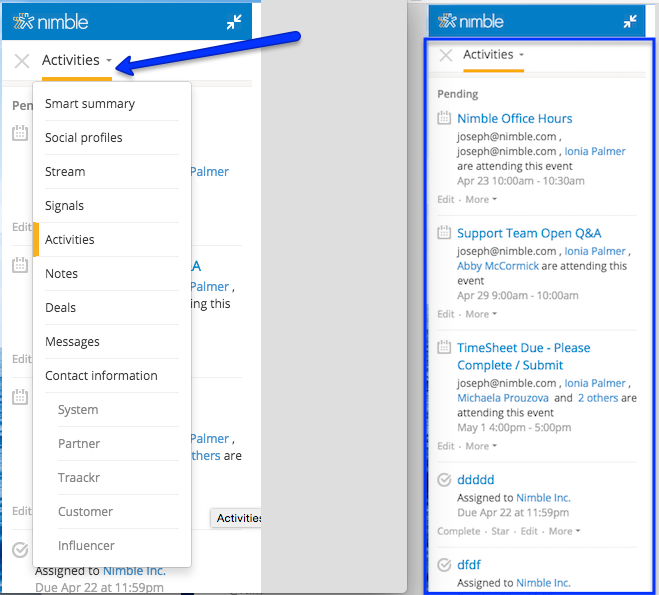 The Nimble Smart Contacts App for Google Chrome amplifies your workflow by giving you visibility into email, social signals, activities and follow-up reminders -- all without having to switch browser tabs. We have updated our Nimble Smart Contacts App to give you a better Nimble experience within Gmail and everywhere else you work in Chrome. 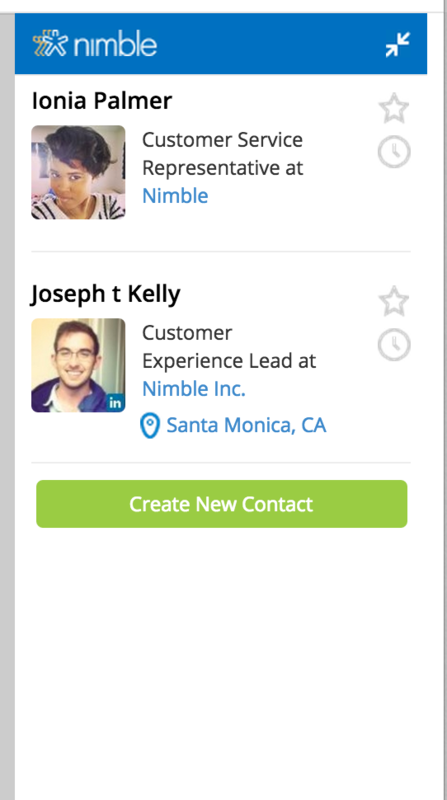 The Nimble Smart Contacts App allows you to see insights on all of your contacts instantly, anywhere you work. It’s available to use Nimble on top of any existing website or web application you use at your company. See the "Live Profile" for any person or company - this is a record we automatically build for you, complete with company, location, title, and social insights. All available without needing to create a contact record in Nimble. See existing contact records to take action on your Nimble contacts. Hover over any contact in an email thread to bring up their Nimble information. 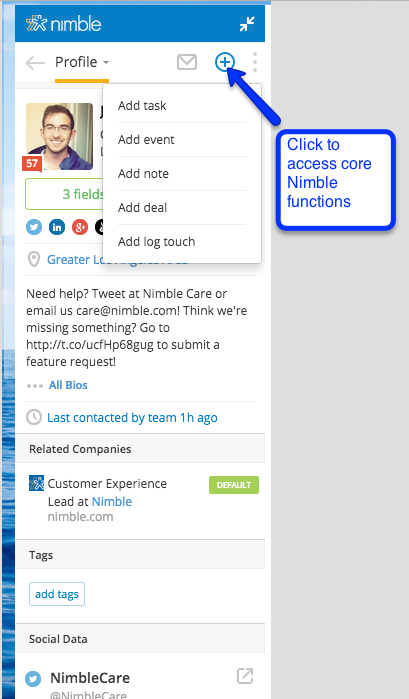 Access all the functions of Nimble while you work alongside your Gmail inbox. 2. Add the app to Chrome. 3. 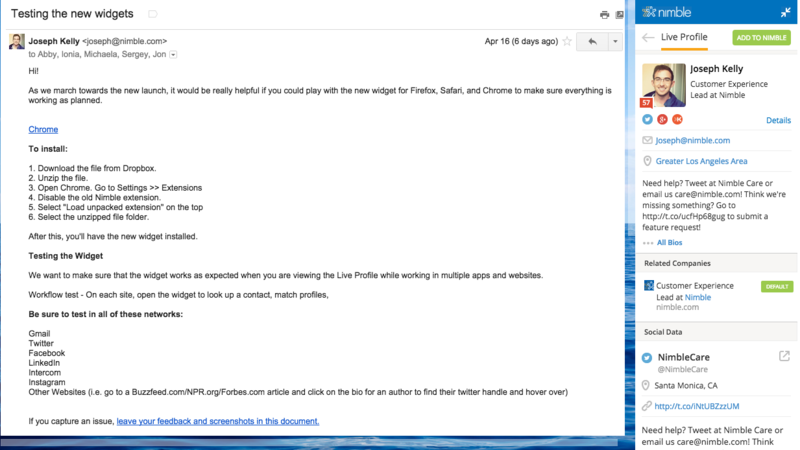 Open the app in Gmail or in a new browser tab, and then sign into Nimble on the right-hand side. Hover over any contact in your thread to bring up their Nimble profile information. Add, edit, or update your Nimble contact records. See a full and complete record of your communications history with that contact. Set a schedule with the Stay in Touch reminder system (If you fall out of touch, Nimble will remind you). Check on any of your contacts’ social networks and reach out on other channels. Add and Assign Activities to yourself or your team members or task reminders for future actions. The sidebar will highlight all members of an email thread on the right-hand side. 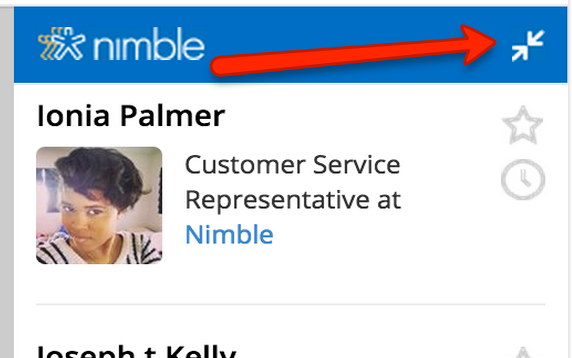 Hover over any email address to bring up that contact's profile or add them to Nimble to start taking action on their profile. Email, call, log tasks, notes, or view any contact details from within Gmail. Scroll down to see all contact history, upcoming tasks & events, social stream, and contact data with any of your contacts in the thread. How do I collapse the display? To collapse the display within your Gmail account, click on the "expand" arrow on the top-right in Chrome.